We will be touring the Isle of Man between 8th and 11th August. We will be playing two matches whilst there, one on Friday evening and one on Saturday afternoon. If anyone would like to come along as a playing member they should contact Alex Driver by e-mail at alex@jbsprings.co.uk. The teams we are playing are expecting to have large support and so as many WRUFC supporters as possible are welcome to come along to even the numbers up. Wharfedale 38-24 Stourbridge – The full report is now available under the Fixtures tab near the top of this page. The match photographs are available under the Photos tab – follow the Link to Flickr Album. John Brewster is kindly arranging a supporters coach to the Colts National Cup Final in Worcester on Sunday the 5th of May, so as many supporters/parents as possible can attend this historic match and support the lads. TBC Drop off at original pick up points – could be late and especially if the lads win! The coach cost is only £15 per person and it will be great to see as many supporters there for this momentous game and to support the lads. Book now by calling John on 07957 867230 and don’t miss out.. This year the Players’ Dinner will be held at 7.00pm for 7.30 on Friday 10 May. More details are available by clicking here. Payment in advance can be made by players to your Team Manager and by non-players to Robert Fort. Payment may also be made on the night. From 25-27 April, six of our members will be cycling from Peterborough Lions RUFC to Wharfedale to raise money for Yorkshire Air Ambulance as a thank you for their role in rescuing Michael Harrison after his accident last year and, more recently, ensuring that young Jack Midgley was transferred swiftly to LGI after being badly injured in an under 14 match. Half the money raised will be given directly to YAA and half retained by the club to buy YAA branded match balls and other merchandise which will be used throughout the 2019/20 season to promote YAA as a constant reminder of the fantastic service which YAA provides to our rural community. The riders are Matthew Bell, Robert Fort, Nick Gains, Alex Howarth, Tim Lockett and Dave Townson, supported by Michael Townson. They will also be joined by a friend of Tim’s from London, Alan Jackson. The group will arrive at the ground on Saturday 27 April in time for kick-off on our last 1st XV game of the season. It costs £6,000 to keep a YAA helicopter in the air for a day; match balls cost around £40 each – and we get through a lot of them! – so we would like to encourage all members and supporters to dig deep to support this fund-raising effort. To donate online please go to https://www.justgiving.com/crowdfunding/bladesandballs. Remember – £40 will buy one YAA match ball or keep a YAA helicopter in the air for 5 minutes; £100 will keep a YAA helicopter in the air for 12 minutes – the average flight time for a single incident. Issue 84 of the Rugby Club magazine includes an article profiling Wharfedale – click here to see Rugby Club: Issue 84. 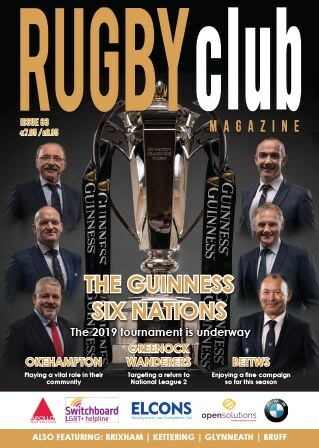 The Rugby Club magazine is a free publication funded by advertisements which seeks to promote community rugby clubs around the UK. We are grateful to Simon Ravens and our sponsors who agreed to be interviewed for the article. We are delighted to announce that coaches Jon Feeley and Jon Skurr have committed to the club for the next two seasons in order to build on the progress the team have made this year. This coaching duo, supported by Chris Black on fitness and our outstanding medical team of Dr Sam Lyles with physios Jill Alexander-Riley and Rachel Galley, are the envy of many higher-ranked clubs. Wharfedale RUFC has a proud track record of developing outstanding rugby players and we remain committed to investing in the development of players and giving them the best possible environment in which to perform. This year the NatWest RugbyForce Day will be held at the club on Saturday 22 June. We hope that as many players, supporters and parents will turn up on the day to assist with preparing the club for the new season. Please be advised that Club Members can now purchase tickets for England’s Quilter Internationals 2019 in August and September, against Wales, Ireland and Italy. You can buy up to eight tickets. Demand is likely to be extremely high, so please expect to queue to enter the ticketing website. Please note that Wharfedale RUFC are not responsible for supplying these tickets and they are available to purchase by entering the RFU website by clicking here.